We profile Procter & Gamble's CMO for laundry and fabric care - the woman behind Ariel's famous Share the Load campaign. In the 1990s, P&G's detergent brand, Ariel ran an ad on television in which a man calls people home for dinner and his wife makes him clean the dishes the next day. Titled 'Ariel Husbands', this was part of a campaign that KV Sridhar and his team at Leo Burnett, created at the time. It was deemed progressive for its time. 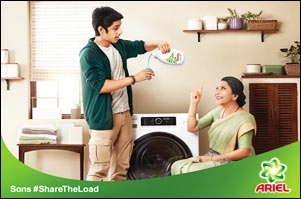 Cut to 2015 - P&G's chief marketing officer, Sonali Dhawan sat with Josy Paul's team at BBDO to brainstorm for an advertising burst - a discussion that birthed the now famous 'Share the Load' campaign which, at its core, asks a simple question: Is laundry only a woman's job?' At a recent P&G event, Dhawan was part of a panel discussion about Nielsen's recent research on attitudes to household chores. We caught up with her on the sidelines of the event. Dhawan, chief marketing officer, fabric business unit head, Procter & Gamble, Indian Subcontinent, has been with the company for 20 years. She joined P&G back in 1998, as area business manager for Pantene in India and she worked with hair care till 2008. She has worked across brands for pet care in Asia (2010-2013) including Iams and Eukanuba. She handled beauty for P&G India (2008-2011) which included Olay and was in charge of media operations for P&G India (2008-2011). When the company offered her assignments in Thailand in the 1990s, she couldn't move because of marital constraints. Nevertheless, she managed a setup wherein she worked out of India for 15 days a month. Eventually, in the same decade, P&G moved her to Singapore before which she where she handled hair care for almost 10 years. She was presented with the opportunity to return to India at around 1998. "At the time, my husband was starting his own company in Singapore. I asked him if he thought we could move and he said he wouldn't have minded starting an office here. So we started an office here and then I got an opportunity to go back to Singapore (around 2011)" Dhawan recalls. Eventually, when her husband wanted to move back to India, P&G helped by assigning her to work in India again. "My journey has been one where the company has supported a lot of the career choices I've made and has enabled me to really travel and work across multiple brands. The role in India is across a lot of brands like Gillette and Whisper, with laundry at the centre. For me, it's been an exciting experience...," she states. Besides Ariel's 'Share the Load', other award-winning campaigns she was closely involved in the creation of include Whisper's 'Touch the Pickle' and Gillette's 'Soldier for Women'. One glance at these titles is all it takes to recognise the halo around them - each a cause-led ad campaign. "Brands have come a little bit further than just selling the product," says Dhawan, to whom it's almost a 'moral obligation' for popular brands to try and change society. "Every brand needn't necessarily have a cause, but if you think you have the influence and the stature as a brand, it's an obligation to try and make a difference," she outlines. She recalls the birth of 'Share the Load' as a concept and the conversation that started it all, "I'm very passionate about brands making a change. We were discussing how the product benefit of Ariel is very obvious... but what impact does it have on life? And how is it more relevant to life and all that? I said, 'Okay, if it's such a great product, what does it mean?' It means - the chore of doing laundry can be really easy. And what's more, anybody can do it. So it started as a conversation of how the product makes a difference in life..."
That train of thought then evolved. "We agreed it was an excellent thought - the brand can enable sharing of laundry work between men and women - so we decided to really stand for the cause. We had a 'jam session' with the agency where the thought became bigger and we believed that this is a question worth asking and a cause worth fighting for." When asked what the first draft to the agency was like, Dhawan says, "We don't actually have this conventional process of a brief - what we have is a discussion." Around two or three years back, a lot of brands started looking for causes to support. It has now reached a crescendo. Every other brand indulges in 'activism advertising'. We were curious to know if Dhawan and team took that into account. "There were a lot of brands talking about equity at work," she responds. "Thinking back to 2015-16, there were some conversations which were about getting the women to go outside and excel... but actually, what we realised was, if they don't have the support at home, then even that is not possible," Dhawan shares. Dhawan explains that they conducted a survey to gauge the sentiment of the market and country. In 2015, 79 per cent of the men (almost 8 out of 10) surveyed (1,000 men and women in Mumbai, Delhi, Bangalore, Chennai, Hyderabad) by the research firm thought household chores were a woman's job; in 2016 (542 men, women, kids -10-14 year olds- from Mumbai, Delhi, Bangalore, Hyderabad), the figure was 63 per cent; in 2018 (897 married men and women -25-48 years- from Mumbai, Delhi, Bangalore, Chennai) by the research firm thought household chores were a woman's job; in 2016, the figure was 63 per cent; in 2018 it was 52 per cent. As per 2018 data, 68 per cent of the men surveyed feel weekends are for relaxing, but 72 per cent of women think it's for housework. Moreover, 68 per cent of women come back from work and do laundry regularly; for men, this number is 35 per cent. 40 per cent of Indian men don't know how to operate a washing machine, according to the research. "So it didn't start as - Make a brief on ABC. Instead, it was about the conversation we wanted to have..." says Dhawan. The first year, her team asked the question 'Is laundry only a woman's job?' The year after, they investigated the reason behind these attitudes. She clarified that the attitudes are common, regardless of marital status. "It doesn't matter whether the family unit is a live-in relationship or something else. At the end of the day, it's a shared home - and a shared responsibility," she says. The campaign's zone of influence is not limited to the metros. "There are many towns where girls don't have a voice and find it very difficult to say something. They get the message across when they share films such as this, over WhatsApp. In a conversation I had with my maid, I showed her the film even before it was released and I asked her what she thought," Dhawan shares. She recalls her maid saying that she really liked the video and surprised Dhawan by asking her to send it to her. "When I asked 'why', she said she would send it to her sister and her jijaji... she thought her sister could not directly confront her husband about this...," Dhawan signs off.